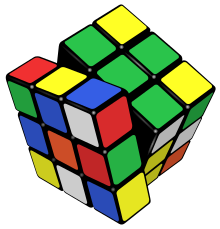 Rubik's Cube Simulation and Solver. On the auspicious occasion of 40th Anniversary of Rubik's Cube I would like to share with you my "Rubik's Cube Simulator and Solver". I made it some years back, so many of you might know of this (from my facebook). Despite many requests, I haven't planned to share my source code of this application. Its not because I don't want to share, its because I coded it two years back with Swapnil Sneham and its all spaghetti in there. We had to complete it in limited time, and we had other projects in hand as well. Due to this, the app is still not well finished and might even be buggy. The contents of the blog by Sushant Kafle is licensed under a Creative Commons Attribution-NonCommercial-ShareAlike 3.0 Unported License.